Always Green Pest Management wants to alert you about information to reduce the mosquitos population in Tampa Bay. We are especially concern about the recent spread of the Zika Virus in Tampa. This disease is not only very harmful to pregnant women’s offspring, but new research is being conducted regard the effects to adults and seniors that the Zika disease may also attack the brain stem and have an impact on an individual’s ability to learn. Mosquitoes breed by laying eggs in standing water. These eggs can produce flying mosquitoes hungry for blood in about a week. One teaspoon or bottle cap of standing water can breed and multiply mosquitoes quickly. 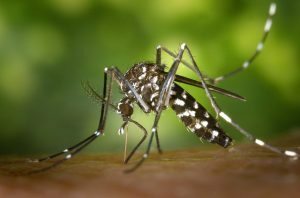 These mosquitoes typically only travel a few hundred feet from the spot they were bred. Every few days, empty, turn over or cover any container that holds water: flower pots, tires, buckets, toys, pools and pool covers, birdbaths, trash containers, recycling bins, boat or car covers, roof gutters, coolers, and pet dishes. Discard anything that can collect water: old tires, drums, bottles, cans, pots and pans, broken appliances, and other items that may collect water. Put away items inside the garage or shed that are outside and not being used because they could hold standing water. Constantly keep flower pots and saucers free of standing water. Some plants, such as bromeliads, hold water in their leaves—flush out water-holding plants with your hose once a week. Maintain swimming pools in good condition and chlorination. For more tips on preventing or reducing mosquitoes, visit HCFLGov.net/MosquitoNinja. You can also report a mosquito-related issues to Hillsborough County Mosquito Control by calling (813) 635-5400. The Department of Health has also created a kid-specific campaign called Spill the Water! at SpilltheWater.com that has great information for families.